The rocky walking path and hilly peaks seen in this black and white image may be from Wilkesboro, as indicated by the the postage stamp on the opposite side of this postcard (see Pal-Bla-4-264). Damage to the card is visible in the large yellow spot in the middle of the image, as well as the discoloration in the rocks. 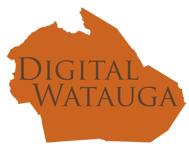 “Postcard featuring a Rocky Walking Path,” Digital Watauga, accessed April 19, 2019, http://digitalwatauga.org/items/show/3830.